United States Tennis Association (USTA) Southern announced recently that Derek White, of Savannah, Ga., was nominated to serve as USTA Southern Board of Directors President & CEO for the 2017- 2018 term. 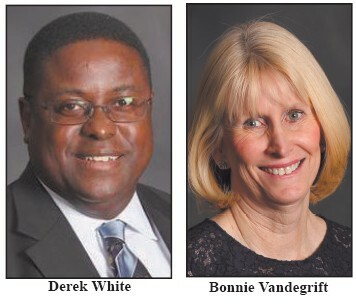 When elected, White would be the first African-American in the top leadership position of USTA Southern. His first year on USTA Southern Board of Directors was in 2007 when he served as Secretary. In 2009, he began three twoyear terms as Vice President. In 2015 he was elected Executive Vice President. A graduate of Mercer University and Georgia Southern University, White has also served as a member of the USTA Georgia Grievance Committee and the Executive Director Search Committee. He has held numerous positions at the national level. He has served on the USTA Constitution and Rules Committee, Tennis and Rules Committee and the Chair of the Grievance Committee for the 2015-16 term. The members of the USTA Southern Board of Directors will be voted on by the Southern Section’s nine state associations — Alabama, Arkansas, Georgia, Kentucky, Mississippi, North Carolina, South Carolina and Tennessee — for the two-year term beginning on Jan. 20, 2017. The state associations will also vote on the USTA Southern Nominating Committee nominees at that time. USTA Southern is the largest of the U.S. Tennis Association’s 17 sections, representing nearly 25 percent of the national membership. Bonnie Vandegrift, of Asheville, N.C., has been nominated to the post of Executive Vice President of USTA Southern. In 2015 she was elected to her second two-year term as Vice President. She is the board liaison to the Adult League Committee. She previously served one term as Director at Large. Prior to becoming a Vice President, Vandegrift served 12 years on the USTA Southern League Committee, four years as Chairman and four years as Vice Chair. She is currently completing her second two-year term as Chairman of the USTA League Committee and has been a member of the national committee for 10 years. She also is a past President of USTA North Carolina and the North Carolina Tennis Foundation.